So vivid I felt like I was on the bus with you. Another choice is maybe don’t travel in Penn. in February during a snowstorm. Glad you got home. An option for going vegan?! Well it fits the bill – I really don’t want to do it and it’s incredibly foreign to me. Ugh. I feel your pain! Just last weekend I sat through a 5 hour Megabus ride and had children kicking the back of my seat and throwing crisps at me whilst the woman opposite me had her legs spread across both seats whilst drinking a flask of coffee and writing letters! I’ll definitely have to try your lotion technique! That sounds terrible and I’m so sorry for your pain. Try the lotion but you really have to commit. I’ve been on this bus… except I was sandwiched between an army guy who had spent 2 days with his girlfriend and wouldn’t stop talking about it and, a guy who had just been released from prison for… well I’m not really sure I want to know what for. I’ll be happy to NOT do that again. the talkers. the talkers are the worst. except I met an awesome person who sat down beside me one time. we both had every intention of watching a movie or tv show and nesting in peace but we got to talking and conversation was far more interesting than the alternative. made for a really quick ride! try the lotion next time. It has been awhile since I have been on a Megabus. What you describe is a weekly trip to Niagara in one of our many snowstorms with He-Who at the wheel. I am a fat, white women. His driving will surely give me a heart attack one of these days. Ah, Jackie, you don’t read my blog. Most of my stories (not all) in my blog are about He-Who. He-Who is what everyone calls my husband. It is short for He-Who-Must-Not-Be-Named-For-His-Own-Protection. No problem. I get so use to everyone calling him that I don’t even think about it anymore. Even his family calls him that now. It sounds to me like the pink-faced fat man was the ANTI-death. If that was the driver and not Tom? At least you would have had the life-size teddy bear to cushion the landing in the event of a crash. But seriously folks….I hate those white-out drives. You can’t stop, or someone will plow into you, and you can’t see to go on. Why, oh why, don’t we all move south? 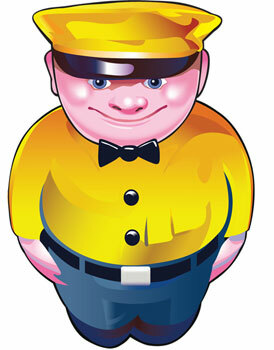 Well, the driver was successful in warding off death, the fat man on the side of the bus representing the megabus logo is surely its harbringer. Good thought with the teddy – why didn’t I think of that during my near-death experience? DAMMIT, PEG – I WOULD HAVE NEVER MADE IT. And yes, seriously – I’m all for complete and total shutdowns of everything when weather is poor. Oh make me laugh.. I do the pgh to nyc trip with a stop at State College and that horrible truck stop about 1 1/2 hrs toward NYC. Not a light weight myself but I still fit in my seat. However I seem to be getting more walmart sized people sitting on or close to me. It amazes me the amount of food/drink people bring on board. I see mom, dad and two kids eat the whole trip. Being older I do not drink liquids before departing or during the trip. Using the megabus bathroom has cured me of that. Generally men do not like to sit to pee. Standing up however and the way the bus shakes lets you mark the whole cubicle from floor to ceiling. I also wonder if this will be the trip that makes the national news accident of the month. Great article. I have to say, your lotion idea sounds like a brilliant way to deter people from sitting next to you without anyone realizes they’re being deterred in the first place. Plus I’m sure your hands end up extra silky smooth!